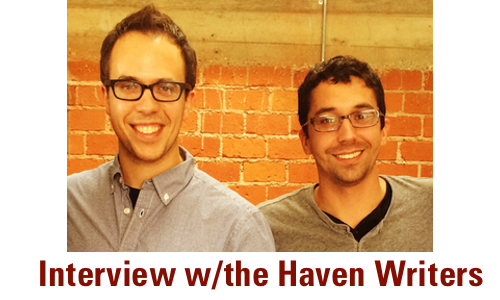 Posted by Aimee J. August 6th, 2014 | Comments Off on Interview with Haven Writers! So imagine how I and Amy S. feel when we show up and learn that we’d be meeting with Brian, Nick Parker, Shernold Edwards, AND SpeedWeed. 😀 Let me help you with a visual of our inner thoughts. But enough from me, here’s the interview. I’m still working on a transcript. 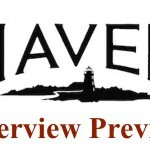 Aimee J.: Hey Havenites, this is Aimee J. coming at you with Amy S. for a very special interview with the Haven writers. Now, I know most of you were turning in questions for just Brian, but we were lucky enough to ask those questions to not just Brian Millikin, but Nick Parker, Shernold Edwards and Speed Weed. So, I know you don’t want to hear from me, so without further ado, here they are. Aimee J.: We appreciate it. Brian: Thanks for always supporting the show. Aimee J.: We actually asked, as soon as Brian said you guys got the go-ahead, well you know what, let’s put it to Twitter and so some of them sent some questions in. We also want to caveat there’s some things you can’t answer, we get it. I personally think, you know, if you can’t answer it, good. There’s something about spoilers, you know. Shernold: Brian loves a spoiler. He won’t give you any. Brian: Oh, it’s fine, but yes, the inability to answer a question is itself an answer to the question. Nick: That means it’s getting to something. Brian: Yeah, it’s too bad because I think there is a trailer coming up for this season on the 31st? Amy S.: 31st yeah, yeah. Brian: So we probably could talk about more then, but we literally have no idea about this upcoming season, what we can and can’t say. I think probably extreme generalities. Shernold. : There is a guy named Nathan. Brian: Well yeah, but we’ll, we can do our best but the past is always, is pretty safe, unless it affects the future, which the past usually does. Aimee J.: The past always does. Nick: Yeah, what you got? Aimee J.: …see what we can do, and we’ll intersperse, you know, questions and we’ll kinda go from there. Nick: Yeah. That’s probably one we can answer, right? Brian: Yeah. I mean, um…. Nick: Back in the day, 83, so what’s been interesting is that every iteration that Audrey, the Audrey kind of personality has come, be it Sarah or Lucy or others in the past, she has made friends in Haven that she’s worked with. We saw a little bit of it in episode 309, Sarah, whenever she was kinda starting to meet Vince and Dave, we had suggestions towards that. And then we’ve always kind of, there’s always been hints towards her relationship with Garland and what kind of relationship that was, and stuff like that. Brian: Yeah, there were actually at times there were even stronger hints that ended up getting cut out of the script or even cut. But, for sure, I think the implication was supposed to have been, and it kinda was a little bit, and obviously it’s not the same every time, but there’s like a Nathan and a Duke now. And it’s not that they filled the same roles back in the day, but that she just sort of, the way that sort of, the cycle of life for her specifically and her destiny in general kinda works, that there was a Wuornos in her life, in Lucy’s life, back then, right about the same age that Nathan would’ve been now, which is why we were careful when we cast how old the guy who was gonna play his dad was. And there was a Crocker back around then, too, although not obviously the same as Duke and a little more like a bad guy, but, and he would’ve been right around the same age too. He loved the bad stuff. But yeah, that was sort of intentionally done. There’s gonna be some more about that coming up this season too. A little drips and drabs about maybe some of the Lucy, Garland. Nick: Yes. There’s an understanding that those people like Garland, like Vince and Dave in the past had interactions with Agent Howard. Brian: Yeah, what we had imagined, I guess, specifically to the question is that, and this is even dating back to in the pilot when that phone call that Agent Howard places at the end of the episode, was that we always knew that, you know, he was talking to Garland and that we were gonna reveal that later in the season. And a couple episodes before Garland was gonna die, because he was always gonna die at the end of the first season. The guys who created the show had a massive plan, mapped out all of this stuff, which we are still using to this day, which is crazy. Brian: I wanna say hands off approach, but sort of like, let her do her thing. Like this is the way that it’s supposed to be. This is like the cycle and we’re sort of in favor of that. Nick: I think that covers it. Aimee J.: Yeah, I think that’s like you said you covered it. Brian: I did a cameo. I was there. Nick: No, Brian did a cameo. Aimee J.: Brian did a cameo? Nick: I did a cameo but it was cut out. Brian: Yeah, the first episode that I actually wrote was in the second season, it was a Christmas episode. Amy S.: “Silent Night” episode. Brian: That’s right, hey thank you. And I refused to do a cameo. They wanted to make me a waiter at the bakery. Amy S.: Sam did a cameo, right? Brian: “I can’t do one before my boss does.” And she’s like “Oh, oh we didn’t realize. We’re so sorry.” So we put him, they put him in. Shernold: Was that a Canadian story? Brian: So he got thrust in and he was upset about it and then everyone realized what I did, so then there was this shot where everyone shows up again in the movie theater and towards the end of the episode and I’m sitting in like the second row. You’ll know me by the glare off of my forehead. It is unmistakable. Brian: Being an extra, I don’t know if you guys have done it before, but being a background artist is not as easy as it looks. If you’re a bad actor, you can tell. You can watch the background of some scenes of our show, or any show, and be like [grumbling]. I’m one of those people. I’m terrible. I’m on the second row and I’m supposed to be acting like “what happened?” and I’m looking around. I’m terrible. Brian: And I’m literally bringing the scene down for everyone else around me. It was awful. Nick: From the background Brian. Brian: I know, so it was terrible. And my own parents never knew that I was in the episode, so it was really upsetting. Aimee J.: What this means is that now all the Havenites need to re-watch “Silent Night” and find Brian. And tweet the time that you found him, just so we can verify that you actually watched it. Brian: They will know me by the forehead glare. Aimee J.: There you are. Nick: Well Nathan’s trouble was Sam and Jim. Brian: Nathan’s trouble was all Sam and Jim. Nick: Yeah, from the get-go. Idiopathic neuropathy. Brian: It was one of the ways that they sold the show, back in the day. Nick: To the Gloria question, I think it’s uh, Matt McGuinness who’s the show runner/producer created the character and wrote kinda the first pass at her, but then once we, and so we kinda had an idea of, you know, how she was gonna feel and everything, but then once we got into casting, saw the casting of Jayne Eastwood, who plays Gloria, she’s awesome. And she was also in that Dawn of the Dead remake back in 2004. Brian: Yep, yep, yep. She’s great in that. Nick: She’s excellent in that. So, Brian and I both immediately recognized her from that and we were like this one’s hilarious, we can write like this kind of dry humor for her. And once we started seeing the dailies come in, she was great and so we saw what she was doing with the role and kinda tried to write more to that. So I think it’s less who writes the hilarious dialog for her as to how she performs it and how we kind of write to her strengths. Brian: Yeah, it was, but yeah, Matt was, she first showed up in episode 306, 406? 406. “Countdown.” It was just last season? It was! Oh my God. Brian: It’s been terrific ever since. But everyone loved her. She’s a treasure. Shernold: Oh, yeah. I remember the heartbreak. Brian: Oh, it was so painful. Amy S.: He left town and took the cats, right?. Brian: She wrote in episode three, there was, I know, and that was like so we had to kind of squeeze it in because we didn’t have the actor anymore. And this is what just happens in TV production. Shernold had this great storyline for him for what was supposed to be his last episode. Nick: [chuckles] If you do say so yourself. Nick: It was. It was really good. Brian: Through no fault of his own we just didn’t have him anymore. Brian: Yeah, but it became an opportunity. Then we’re like, well, we need to go back to the coroner and we wanted someone who was Vince and Dave’s contemporary, we’d already been talking about the same sort of character who had like existed for a while, so this was like it was all, everything was like great. Nick: We decided we needed more old people on the show. Brian: Yeah. So, and a little bit of humor. Aimee J.: Yeah, she brings that. Amy S.: Yeah. She’s so snarky. She’s awesome. Brian: Yeah, so she’s been great. We’re using her more and more. This season she’s got an even bigger role and some of the best stuff she’s ever done. Nick: She’s all over the place. Brian: She’s like one of like the lead characters in an episode coming up. Can’t tell you anything more about it, but she’s terrific. And it’s like the best, right? It’s some of the best stuff in that episode, right? Brian: So, it’s gonna be really good. Brian: HootnButte? Aimee J.: Is that how you, is that how you pronounce it? Amy S.: Mags, she lives in Edmonton. Brian: That’s how I would say it. In my mind. Aimee J.: She’s done several questions that have been announced also. Shernold: I answered several Hootnbutte questions during the commentary with Speed. Brian: Nice. On the DVD set. Shernold: I don’t know about sharing titles, I don’t think so. Brian: Uh, I’m thinking no. They leak out anyway by the end. I don’t know that we can. Amy S.: I know three of the episodes’ titles. Brian: What do you know? Brian: That’s correct. That’s the first episode. Brian: How do you know those?? Amy S.: Do I have those numbers right? Brian: Yes, you do! How do you know those? Amy S.: Social media! It’s on Twitter and it’s on Facebook! Nick: They make their way out. No, it’s, that’s fine. Brian: Yes, five and six is a two-parter. Nick: Uh, you definitely can’t reveal the titles of your first two episodes. Shernold: I don’t even remember the titles of my first two episodes. Nick: I do and you cannot spoil it. Aimee J.: Can you answer how long it takes to do an episode? Shernold: Yeah, I can say as long as they give you. To be honest, you know, if you’re at the beginning of production and you’ve got some time and some lead-up and you can, you have the luxury of talking about things, and breaking the story with the entire room, then yeah, you can take a week and a half we’ve had up to. Brian: That’s just to write the script. Shernold: Yeah. Of course, of course. Brian: ‘Cause there’s a whole process. Shernold: I would say that start to finish, stop and start:, about a month. Brian: Yeah. It’s, I would say minimum you hope for having like about six weeks. Brian: From like, from “let’s all kick, like sit around and figure out exactly what this episode is gonna be”. But the process, it’s pretty much the same on any TV show. But our show, it’s pretty similar on other shows that I’ve worked on it’s kinda the same. You have to sort of generate first the sort of pitch for the episode will be and then that goes around and gets all the various levels of approval, up and down the board. And then you can finally go off to start figuring out how the outline is gonna look; then once you do that, usually another week or two has gone by, and then you just gotta go through all the same levels of approvals all the way up the food chain. Then you’re finally approved to go off to the script and then you write the script and it goes through the whole same sort of process. Brian: Yeah, figure out then, OK, within this episode then maybe this would be like the trouble that’ll be in that episode and things like that, and start to like kinda flesh it out, so there’s a lot of planning in advance. Nick: But as things roll on and, you know, you start to shoot pages, then you will know for how long you have to write the script gets..
Nick: Smaller and smaller as you move forward. Just ‘cause, you know, you gotta keep ahead of the train. Shernold: …I got ten minutes I gotta go finish so…I’m joking. Aimee J.: Well, depends on how short it is. Amy S.: How many episodes do you write in one season? Brian: I guess sort of depends. Brian: Well, you wrote two episodes last year? Speed: Yeah. I’ll write four this year, yeah, double the number. Speed: It’s a very unusual situation, 26. Aimee J.: Twenty-six at once. I know when it actually came out they said don’t panic we’re already in writer’s camp. You guys were already kind of working on it. Aimee J.: Yes, I was wondering that. Brian: Like I love Homeland but it seems like they, after the first season, they’re like “who knows what the second season will be?” And sometimes that can work out just fine, but I think the more supernatural the show, the more they sorta need to know that it’s not gonna turn out like Heroes, I guess. But so, Sam and Jim, the best thing that happened from them is that there was a time when, ‘cause originally it was an ABC pilot ‘cause Stephen King, most of his shows up until recently were all sort of ABC mini-series, that ABC was like we like the script, we like all this, everything’s great, Stephen King approved everything up and down. We don’t wanna make a show. What about, could you do like a mini-series version. How about like ten hour version. So then they came back in and pitched them a ten hour version of the entire series, where roughly every two episodes was the end of the first season, it was like the end of the second season. And even down to like the third season. That’s when like the barn was in like probably episode five, that sort of thing. But what was nice about that when it got to the ending of the mini-series, which was the ending of this sort of story and if there was going to be another mini-series, would be like kind of gearing up again for a different one. And so it provided them an opportunity, it was brutal, like their noses were bleeding, like they couldn’t handle trying to like figure out how basically a series might end, that sort of stuff. But they had this sort, this map, and although that never happened, then the pilot moved to Syfy and Syfy was like “we wanna do a TV show” and they’re like “thank God!” And they threw away their whole like sort of plan, but from that point on we’ve sort of had an idea. And so they always knew like what the last shot would be. Shernold: That’s the first time I’ve heard that. Brian: layers of the onion, like sort of peeling back, like this is great. That’s why I’m still here. I was there for all that. I was taking notes for them in Sam Ernst’s garage when they were still just trying to sell the pilot. It was crazy. Aimee J.: So you were there from the beginning. Brian: I was there from the beginning. I was there, in the beginning there was Sam, Jim and me taking notes. Brian: Matt McGuinness and I were both on the show in the first season. We’re the only ones. You guys started in season three. Aimee J.: That’s kinda early on, also. Brian: Yeah. But Matt was here until episode seven of season one and then departed and then came back at the start of season two. I’m the only one that’s been around for every episode now. It’s pretty crazy. Brian: So I’m a bit terrified now. Speed: There’s really nothing that you can ask that Brian can’t answer better than the rest of us. With that said, Shernold and I have to go work on 17, so if there’s anything you want to ask the two of us. Shernold: Ah, thank you so much. I was happy to sit here like a lump in the corner. Shernold: Sit here and do nothing. Unless you have a specific question for me or…? Aimee J.: Well for you. Shernold: To be in the room? Aimee J.: To be heard. In the sense of, you know, it is male dominated at the moment. And not just as you came out with that wonderful TV movie. Shernold: Yeah, oh! You watched that? Well, thank you! Aimee J.: It was good. Aimee J.: And so, um, what have you found challenging in the process of becoming a writer? Shernold: This is my first job in the States. So, you know, I came here from Canada with a lot of varied experience. I had worked for a network as a production development exec. I worked for an independent production company as a creative exec. From that I staffed sort of a junior position on a half hour and then after that I crazily ran the second season of a comedy. So by the time I got here I don’t think I, up to that point I hadn’t experienced any sort of gender differentiation. This is a completely different industry, US versus Canada. I think what helped me coming here is that because I had a base level of experience I was less terrified, than say a new writer would be, but I was still pretty terrified. So in terms of whether it’s hard to be heard, in the room, this is the, I would venture, the most amazing room in the United States of America. Speed: We’ve got a good room for sure. Shernold: We are a family. We are a real family. And there is no squelching of voices. There was naturally for me being new, being new to the country, being new to the genre, being new to the room, I was quite quiet in the beginning (I’m sure Brian remembers), you know, but I think any smart writer who is in there for the first time would be quiet and watch and learn. Shernold: And what have you. And, as I’m sure I would think my colleagues have noticed over the last three seasons, I have gone from being quiet to, I have an opinion here and there to shut the f*** up, why are you still talking? So, um, yeah, this has been completely supportive. Gab has set a standard for show runners, both Matt and Gab have set a standard for show runners that I’m not sure that anybody will be able to meet again, but they are encouraging and welcoming and give you much more, I think, than you deserve to get from a busy show runner in terms of feedback on your work, feedback on your performance, reinforcement, things like that. So I think that if I had come here and landed in a different room, in a less pleasant room, then I would’ve felt, you know, not just gender but in terms of diversity which is a whole different issue, if you have two hours we can talk about that. Speed: And the Canadian thing is a factor. Shernold: And the Canadian thing. Speed: We just don’t credit Canadians for their Canadian credit. Shernold: Yeah. For all of them. Speed: …Who had to start out at the bottom. Shernold: Exactly, yeah. Hart Hanson was the oldest, he says, he likes to say he was the oldest staff writer who had already created a show and won awards for it. So in terms of being heard individually, in this room, no. And it helps, it helps me, it will help me going into the next job, I think. Shernold: And, for any Haven fans who are also WGA West members, it has also helped me decide to run for a seat on the board of directors. You know, so yeah, I mean I know that gender issues exist. I fortunately have not experienced a lot of that. Not yet. Amy S.: That’s encouraging. Nice to hear. Aimee J.: Speed, a question for you from Twitter user @krnbiren, “Is it hard to keep track of which Haven character knows how much and all the secrets and foreshadowing throughout all the seasons?” Especially since you came in to that! Speed: That’s what Nick and Brian are for. They are encyclopedias. Shernold. : Did Vince and Dave know X and Y? Speed: Yeah, that’s right. That’s actually a very sophisticated question because question one is, what is the raw mythology itself? What actually happened? But then the next one, which is really important, is who knows what about what happened? Shernold: Who was in the room when we talked about that…? Brian: Just to make sure you… . Speed: Well, because it’s one thing to remember what the script was like and then another thing. Because by the time it goes through production, and specifically to editing, it’s a whole other thing. And I think we as writers remember the script better. Brian: Yeah, absolutely. Well to that end, what becomes challenging is not sort of the, it used to always be so easy in the past like who remembers who would’ve know what from when, like what were they sort of privy to. Speed: Basically Vince and Dave knew everything and everybody else didn’t. Brian: Yeah, but to a point. And now there are things like especially starting from, I would say, season, towards the end of season three onward, where they are starting to learn things that they did not know before and other characters are learning other things, but they’re not all necessarily learning the same thing. So that’s when it becomes a challenge and they dealt with this in like Lost a lot too, which was who has learned what and who has told what to whom. Brian: And that’s when it’s almost like there’s like little chips that they’re passing back and forth, you gotta make sure that it’s like, no, no, no, this guy actually wouldn’t know that. But that’s actually an opportunity because then they have to figure out how they’re gonna find that. Aimee J.: How it’s revealed. Aimee J.: And we imagine, I mean, because you came in and then, Shernold, you also came in in season three, you know, how you jump into this and figure out OK, what’s safe and what’s not? Is there a Haven bible where you kinda go like “oh no, the bible has spoken I can’t say nothing about that.” Bible in Haven form. Brian: We had one for the first two years, then just could not continue to update it. It was getting out of control. Nick: Part of that is just from being like in the room, you know. Whenever you’re, like being a writer assistant or script coordinator, you’re in the room almost the entire time, so you hear all the conversations. A lot of times writers go off to, you know, write their scripts off in their room and you might not hear where the ball is being put, you know. So Brian and I were able to kind of always be in the room and that’s the reason why we kind of became door keepers in a way because we hearall, we seeall. Brian:. Because the script coordinator’s job sort of has become more and more important in like the last ten years. The script coordinator of Lost, what’s his name? Gregg Nations? Brian: Ended up taking all of his notes that he put together, like over the show about like “this happened” were published as a book after the show came out. Shernold: That couldn’t be more vague. Brian: No, but Matt was like how old was he when X happened? And he was like I’m pretty sure about this, but we were able to go look it up and like no, no, no, he would’ve been like this. And that’s just stuff like that. And you have to like, you figure out those things in advance and then just try, pray that that doesn’t like ever get past you, almost like a hockey puck into the goal, but like somebody doesn’t like accidently throw in something that contradicts. Nick: The 2015 season premiere. Brian: That was what our boss, Matt, who is one of the two show runners, Matt and Gab, was just calling about ‘cause he’s working on 13 right now and since they, one follows the other, but one is the season finale-ish the other one is the premiere-ish where, but you’re not supposed to have that now. But yeah, but it should be good, they both should be good. Brian: Yeah, bring it on. Amy S.: HavenPrincess, I think that’s Rachel in Toronto. Aimee J.: I think so. Brian: Why just for the first half of the season? Amy S.: Yeah, well actually personally I’d like some Naudrey happiness for the whole thing, but that’s just me. Nick: For the first half of the season, I don’t think we can answer that question. Brian: Yeah, well, I don’t think we can. Amy S.: Can you just tell us how long Mara is gonna be around? Nick: I don’t think we can answer that question. Brian: Nope. The answer is complicated is all we can say. Nick: Mara will play a factor in this upcoming season. Brian: Yes, but how big or how long we cannot say. Aimee J.: Which I get. Aimee J.: So what you’re saying is look at the trailer and see what happens. Amy S.: I’m dying for season five. Brian: But what’s good about it and again sort of in the map sort of way, the road map that the guys had sort of laid out a long time ago, is that we always knew, you know, first season, at the end of the season would be the discovery that she’s not who she thinks she is and she actually was the woman in the picture. And the next season we learn like maybe that, even more, we’ll deepen that and then we would eventually finally be able to reveal who like she originally was and meet who she originally was. And that’s sort of we are, this is what now luckily we’ve got the chance, we’ve made it this far, we’ve been able to actually get to that point which is really exciting. So some of the stuff that revolves around what’s happened with her and everything else is, I think is actually some of my favorite stuff that we’ve ever done. Brian: Yes. I’m super excited about it, actually. Amy S.: You’re not a real boy.And then Duke does that thing. Brian: Yes. The real boy was supposed to refer to his trouble and that Duke, certainly back in season one and then looking back at their history together, was always giving Nathan a hard time about not being able to feel anything. That was, and the real boy thing and the Pinocchio bit that Eric Balfour threw in, ended up making it seem like I think that there was something more there and there really wasn’t. It’s great, it’s terrific. No one, they left it in the cut, but that was only ever supposed to refer to Nathan’s trouble. So there’s, let there be no doubt about that one. Nathan is actually a human being, he’s alive, he’s well. The other one. What is our answer about the things you’ve done? Unfortunately it’s not referring to anything huge that is gonna be, it’s not some big reveal that we’ve been saving too. Aimee J.: You know, I think that’s an answer, though. Aimee J.: So don’t panic about that one. Nick: It’s probably fair to say that Nathan does not have a body buried in the basement somewhere. That he did something super bad. Aimee J.: Which is, I think what fans were wondering. 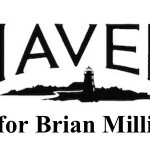 Brian: All the stories in Haven? Or like the troubles particularly or…? Aimee J.: I think the troubles in particular is what she means. Nick: Yeah. Well, I mean that, yeah, the big over-arching thing as Brian was talking about, is kind of a road map in a way. You know, we always kind of adapt as we move forward to try and get the story just right and thematically hit and everything. But in terms of the troubles every week we actually have a big bank that we’ve been maintaining since you put it together in season one, we’ve been maintaining it since then. And it’s 50-some pages or so of just some half baked, some barely baked, some like raw cookie dough trouble ideas. And, you know, a lot of them we know that we’re never gonna use for production purposes or something, you know, like the entire sky is on fire, well we can’t, this is not the Avengers like we can’t have a bomb going off in the sky. Brian: Yeah, so we’re limited by our production. Brian: Yeah, it’s sort of, it’s what Jose Molina back in the first season, how he was always referred to as, he was totally right, about the Buffy model. Which kinda arose, I guess, really probably around season two of Buffy and so many of those writers have gone on to, like to, almost like the next generation writers and X-Files writers. They sort of seeded their craft. But you try to figure out what’s the story for your characters in the episode and then whatever the monster that comes to the high school that week, it serves that sort of storyline. Whether or not it’s like there’s like this crazy thematic parallel, it’s like whoa, what a coincidence, that’s the exact same time Audrey, or Buffy, is having identity problems, there’s an identity monster. Or there’s just something that lets you sort of tell that story. Like last year in season five, four, season four, when I got the episode that I knew at the, we knew at the end that Audrey was going to, that Duke was gonna discover that Audrey was faking being Lexie. Nick: Spoiler alert if you’re getting to that season. Amy S.: “The New Girl,” right? Nick: “The New Girl.” It’s like a Roldex in your brain. Brian: So we just needed, and now we just, I knew we needed a trouble so there was one that I pitched for that episode that sort of a little parallel to that, you know like the episode they’re dealing with looks like they all thought that there was someone new in Audrey’s body, so someone, a trouble about body possession. And also that it would allow us to have that situation at the end where only Audrey was privy to, or only Duke rather was privy to what had happened with Audrey. So it all sort of like kinda like makes sense. Nick: Like episodes seven and eight of this season. Brian: Seven and eight, yeah. But typically trouble-wise a lot of it is just you sort of play on your own like neurosis. Like I had a thing where I literally had a nightmare like two years ago that my alarm clock was a countdown, I was gonna die when the thing got to the end. I was like going nuts when I woke up one morning ‘cause I kept hitting snooze a bunch of times. Brian: And so, yeah, yeah. And then that eventually became an episode. And then when I was a little kid I was terrified of this haunted house picture that I thought was a haunted house. It was just a picture of an old house, in my house. Nick: It’s not a haunted house. Brian: But it’s, so it just sort of like can work its way out one way or another. Brian: That one originally came from Zuckermans if I remember. Nick: Uh, yeah. And it was kind of a, that one was one of those ones that was like, we took a little bit from here and a little bit from here. And kind of came up with this. Brian: Yeah, a lot of it cobbled together from a bunch of different people’s ideas. There’s, ‘cause everyone comes up with the ideas together, like our writing staff and our staff is really great about it. But yeah, that one I think it was, it was, a lot of it especially because Sam and Jim wrote it, they wanted to lean into the idea, ‘cause we hadn’t in a while, about the hereditary nature of the troubles, people don’t even remember how they first got them or where they came from a long time ago, it’s just inherited now. But specifically that one was chosen for that episode because we knew, after we had sort of figured out, we knew going into the third season, for instance, that it was gonna end with the barn of it all. At the Hunter meteor storm and all sort of stuff. And then we knew that we were gonna go into all the Colorado Kid stuff we sort of stuck away in the second season. Brian: We’re gonna go all in and then we’ll reveal the whole thing. But so, then we knew like well then in this episode, you know, the second episode would be when Audrey learns that, you know, she’s gonna have to go away and then she’s gonna give back the dog, it was gonna be great. And then at the end of the third episode we’re like well, we’re also gonna have to put, we’re gonna be pushing the Duke storyline. Brian: So remember we knew that the end of the third episode was always gonna be, Duke is gonna actually have to kill a troubled person, but we didn’t want him to murder someone like murder murder. Nick: And then how do you make that bigger that it’s not just like two or three kids, just like, well, this guy worked in a sperm bank. Brian: Exactly. So we had that idea about someone like that and so then it all just like sorta came together. Nick: Well, in season three we definitely made a concerted effort to kind of darken the show up a little bit. Just, and that also came part and parcel with making the show more serialized, you know. So there was kind of a dramatic shift in season three. So, I think that season four, a lot of parts of season four are, feel to me as dark as a lot of the stuff in season three, but because season three was right up against two, it was such a dramatic sea-change. But I think that we will see, I’m trying to answer this question without giving anything away. Brian: I understand the point about season four. Nick: And I feel it’s even more character-y than season three. Nick: Because and you’ll see in this season, I think I can say this without giving too much away, is that a lot of characters that have come to Haven have not made it and so we’re kind of down to like the main cast in Haven, you know, Haven’s main heroes and this season definitely focuses on those people. Brian: I mean, we’re interested in, like last year something else that also I think contributed to that is that we introduced, for a little while, three new characters. And then you still had, you know, Jordan at that point and time, even though she was returning and there were a lot of characters to surface. And we, while we have new characters kinda showing up, there’s only really this, at least that’s announced anyway, one major sort of new addition to the cast. So which inherently also means that we’re spending that much more time, I think, with our regular characters. So I think that that will go a long ways with helping. Some of it also is just the nature of the story. Last year we knew we were gonna trot William out and then we were gonna end with him sort of getting like a little bit of his last wish, even though after he gets like pitched into the door. So I think this season, because we’re living in some of the ramifications of that, it’s automatically a more character sort of story as opposed to last season we were, there was the search for Audrey and sort of what’s going on which is inherently more plot-y, I think in a way? So, if that makes any sense. I think that whoever asked that question will be satisfied. Aimee J.: OK, Pam, I think, will be satisfied. Aimee J.: So one final question, before we come into a different section, is, when you guys were writing season four, you didn’t kinda know the status of season five. You didn’t know who would be back or anything like that. Now that you have this supersize season, does that change your approach? Because, if you think, you have this supersize season, but don’t necessarily know what will happen after that. How do you, and knowing that Sam and Jim have an idea for the last scene, how do you maintain the overall feel, maintain the possibility of that last scene and still write with uncertainty? Nick: I’d say you always, we’re always trying to write in a way for the end of the season that feels satisfying as both a season end and also, particularly because you never know, possibly a series finale. But what we don’t, like you said, we don’t know after these 26, you know. Brian: I don’t know, I guess to vague it up even more, I don’t know when we would know about whether there would be an actual season six. I have no idea if we would find out, like while we’re still in production, we’re in production all the way until the end of this calendar year. And so I don’t know if we’d find out then or if we find out sometime next year or what, but I do know what we have planned and I think, depending on a bunch of like variety of sort of things, I think they could probably make it work in different directions. Brian: I think it could, it could be maybe like an ending or it could be like a to be continued. You know, I worked on a show, I worked on a show with these guys who produced it called Greek, which literally could not have anything less to do with Haven in the slightest, but at the end of our third season they thought that the show was over and so we did this whole like wrap-up sort of thing and they surprise picked up the show again for a shortened final season. So they went back in and literally just re-cut and cut out the last five minutes of that episode and we cut it, and then the last season of the show became pretty much those five minutes expanded into ten episodes. Like everything that had been applied in this sort of like flash forward kind of way. So you know in like Quantum Leap finale, if you guys ever watched that, is like one of my favorite series finales ever. And they tried to end it on a cliff-hanger to get NBC to pick up another season, but they shot themselves in the foot because NBC watched and they were like “Oh my God, this would be a great series finale! This is an amazing finale!” And it was over. But so, there’s a world, like it doesn’t always have to be like the end, though. Like Lost or Breaking Bad or something, you know, it’s like well, there’s nowhere they can go from there. But it is a tricky dance that we live all day long, ‘cause we don’t know ourselves. Aimee J.: So,I don’t know did you have any questions? Aimee J.: Yeah, so those are all the questions. Amy S.: Well, I did have a really off-the-wall question. If I can ask, this is so stupid but it drives me crazy. So in 302 Nathan comes into Audrey’s office and asks her if she put out the APB. Amy S.: Yeah, so towards the beginning Nathan comes into Audrey’s office and asks her if sheput out the APB and he’s carrying that, one of those really old computer disk floppies. Amy S.: What is that all about? Why is he holding that? Brian: Oh gosh, why was he holding that? Amy S.: ‘Cause originally. I just, it just, I was wondering if something got cut or edited out or something. Brian: It probably did. Now, I remember the image of it. I know that everyone just loves some of the older jankier like stuff. Nick: And I think that’s why. I think it’s like older and it’s like this whole conversion into like, they’re trying to catch up into the new age. Amy S.: I kinda thought maybe that was it. He was looking at some really old files, and things are so old and ancient around there that maybe they still had some of those around. Nick: Yeah. I mean one of the things that I really like about Haven and like before I, you know, was ever on the show, is that, is how it feels kind of like timeless. Like even though, you know, it’s set in the 21st century type of thing, like, that just the feel of the like architecture, the buildings, everything. Even the way like the dress feels very, kinda like timeless. So I like that about that. So maybe that was the props department kind of gesture towards that? Maybe, Lucas Bryant just saw a floppy disk and picked it up. Brian: Yeah, what was it? It was really something because at the end of 301 is when they had found the message in the coffin. Amy S.: OK. ‘Cause he does reference looking at the Chief’s files at times. Nick: Yeah, there was a, there was a joke that was, I think cut out of that episode. Nick: Remember Thor Magnusson’s job? Nick: Thor Magnusson, the troubled guy from that episode. Brian: He’s still wearing the shirt, but we never see what his job is. Nick: He was a video store clerk. And I remember Matt with the most awesome character description I’ve ever heard, a shell of a man in a dying industry. Brian: And that’s why he’s wearing like a Blockbuster shirt or something like in the episode, but it’s never mentioned. Nick: And it was like so sad. Nick: So also outdated technology. Brian: We end up seeing like one of Garland Wuornos’ like old computers in the upcoming season, which is hilarious. Amy S.: …one of, well we’ve seen that in one of the photos on Twitter. Brian: But, so you’ve, what you’ve done is you’ve accidentally stumbled on I guess what has become sort of a motif on the show, which is all this ancient technology of Garland Wuornos’ that continues to crop up. Nick: He just never updated anything. Brian: Which is really funny. Aimee J.: It just kind of fits, right? It fits with the character. Brian: This is like Inside the Actor’s Studio. Aimee J.: Oh, you wanna try? OK, let’s do unison then. We could do it, alright? Alright. So, basketball or football? Brian: 100% basketball, we’re both for basketball. Amy S.: Are you a Duke fan or…? Brian: The exact opposite. We both went to UNC. Nick: This is actually probably going to be upsetting how similar our answers are. Brian: The reason why I even got this job in the first place is Shawn Piller’s father, Michael Piller, is a big-time UNC alumni, alumnus. So I got an internship here like a decade, or over a decade ago, through his screen-writing program that he started at that school. Brian: That’s why I’m here now. Brian: We went to school together. 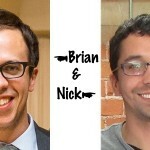 Nick: Yeah, after I got my Masters then I knew Brian from back in college, 13 years ago now? Nick: Yeah, 13 years ago, so that’s, whenever I got here, you know, we started hanging out and that’s how I got in here. Brian: Yeah, all UNC, or I should say all basketball. Nick: Anyway, basketball. That’s the answer. Aimee J.: Alright. Coke or Pepsi? Aimee J.: Ice cream or froyo? Aimee J.: So far everyone is kinda similar. Summer or winter? Nick: Winter is coming, by the way. Aimee J.: Finding Nemo or Toy Story? Nick: Yeah, it’s gotta be. Aimee J.: Pancakes or waffles? Nick: That is specifically a food answer to that question. Aimee J.: Note to self, Brian takes credit for pancakes. Nick: I think my answer to that question is bacon. Aimee J.: That’s a winning answer. Aimee J.: Absolutely. Superman or Batman? Brian: I’m gonna have to go Superman, but it’s not to say that I don’t like Batman. You just named my two favorites. It’s apples and oranges. Aimee J.: It’s just a this or that. Brian: This is upsetting. I’m gonna start crying later. Aimee J.: It’s just this or that. Aimee J.: IOS or Android? Nick: Android, no, excuse me, iOS. Brian: Think about this, yeah, iOS. Aimee J.: OK, are you sure? Should there be a final answer question? Nick: No, no. I, at the beginning I think I was like, Android?!? IOS! Aimee J.: OK, I wasn’t sure. Brian: In Apple we trust. Aimee J.: Oh. Books or movies? Brian: Get out of here, movies. Aimee J.: Action or comedy? Brian: Those are the pretty separate. Brian: I’m gonna go comedy. This or that. Brian: Would like Indiana Jones be counted as like an action movie? Brian: That’s an adventure movie; but are we gonna say action encompasses…? Aimee J.: I’m gonna say it’s action. Nick: I’m gonna say action. Nick: Oh, so you like Transformers, then? Brian: I don’t like Transformers. Aimee J.: He didn’t say that. Brian: I’m just…that’s an action movie. Aimee J.: That’s a dangerous thing to put in someone’s mouth. Aimee J.: Transformers is so…that’s dangerous. Aimee J.: But, that’s it. Thank you so much. Brian: No, that was great. Amy S.: Thank you so much. Aimee J.: And there you have it, guys, our Haven writers. Thank you again so much to Brian Millikin, Nick Parker, Shernold Edwards, and Speed Weed for taking the time to speak with us about our favorite show. It meant a lot to us and I’m sure it meant a lot to the fans. Let me apologize for any awkward gaps that may have been in the podcast because I had to edit out certain things because you weren’t, just because it didn’t either make sense, or it wasn’t part of the interview, you get it. Anyway, some important information: 1. August 12th, season four of Haven will be streaming on Netflix, so you guys can start your Haven marathons. On the weekends there’s enough weekends to kinda get all the season out before the premiere date, which we don’t have, but I’m gonna assume we get in time. Also, if you guys want Haven in some way, shape or form to be at New York ComicCon, let them know. Tweet Syfy, tweet HavenHerald, tweet anyone and everyone you know, eOneTV, tweet them and let them know that you want them at New York ComiCon, ‘cause I think they heard how upset we were that they weren’t at the San Diego ComicCon. We just need to keep letting them know, I mean, how are they gonna know if we don’t tell them? Right? So do let them know, get your friends involved and start watching Haven, and til the next podcast, I’m out. Peace. This entry was posted in General, Interview and tagged Tagged: brian millikin, haven writers, interview, nick parker, shernold edwards, speed weed on Wednesday, August 6th, 2014 .